Lost pet tip: Widen your search and do not give up too soon. POUNDS vs SHELTERS vs NO-KILL SHELTERS, etc. Pounds: Since animal pounds are government-controlled facilities (regular or privately-contracted), they typically utilize the 5-day Federal hold rule, where an animal does not have to be held more than 5 days. The 5 day hold is mandated in order to allow owners time to find their pets. Although some now hold them longer than 5 days, this may depend on how many animals are impounded at the time, the breed or type of animal, etc. Also, the 5-day rule does not apply to animals surrendered by their owners, nor does it apply to animals which have already been held for at least 5 days by a member of the general public or another facility. Once the 5 days are up, the facility has a right to keep the animal indefinitely, sell the animal to a new owner, surrender it for research (all pounds are required to, but some do, some do not), or euthanize. For more details on the various issues, read through entire site, since tips and comments throughout can be most-helpful. Note that if an animal is severely injured or very ill, it will sometimes be put down even before the 5 days are up in order to limit its suffering. Pounds typically will pick up strays, and will also accept animals brought in by the general public. Shelters: Humane shelters, better-known as Humane Societies/SPCAs are defined elsewhere in this website documentation. They are also required to hold animals for a minimum of 5 days, and many do hold them longer. Since they are often overloaded with strays and owner-surrendered animals, "longer" is a relative term, and depends on the numbers of animals currently in stock. Also, if an owner brings an animal in, the 5-day rule does not apply, nor does it apply if a member of the general public has already had a stray animal for at least 5 days. In other words, if a neighbor took your pet in a week ago and now brings it to a pound or shelter, that pet may be processed for sale or other disposal immediately. This is because once the 5 days are up the facility has a right to "dispose of" the pet, meaning the facility may keep the animal indefinitely, put the animal up for adoption, surrender it for research if so licensed, or euthanize. Humane Societies/SPCAs and no-kill shelters typically do not pick up strays (unless contracted to do so), but do accept animals from the general public. Again, see further info elsewhere on this website. Some agencies will not allow you to read through their listings of dogs and cats brought in to the facility. Sometimes this is because an agency (which is not a city pound) may consider the list their private property, not open to the public. But this can also happen because many times such lists exist only on their computer system. In such a case, you are at the mercy of the agency employee or volunteer to search the list properly, carefully, and adequately. Worse, many facilities keep lists available for only 30 days. If you have lost your pet some time ago and you want to review back listings, and if your pet has already entered and left a facility more than 30 days ago, there will be no way for you to know. In such a case, we strongly recommend continuing your search, setting yourself a schedule, a determination of those things you will and will not do, and giving yourself a deadline as to when you will stop searching. Then do the best you can, and if you do not find your pet within that time period, simply accept it. Since many pets are out wandering on their own, or taken in to a temporary home, for some months or even a year or so, please do not give up too soon. No-Kill Shelters: No-kill shelters sometimes do euthanize animals, but typically only if they are ill, injured, or considered un-adoptable. Many do not euthanize even those which are problem animals, but instead, attempt to locate homes or sanctuaries which can deal with the individual's oddities. No-Kill shelters are not mandated to pick up strays, and are not mandated to intervene in cases of abuse, although most typically accept strays from the general public. These organizations are also required to comply with the Federal 5-day rule unless a member of the general public or another facility has already had the animal for at least 5 days. Rescue Groups: Rescue groups sometimes specialize in a particular species such as cats, dogs, ferrets, etc., but some further specialize by breed or type. These organizations are also required to comply with the Federal 5-day rules as noted above. Research Labs: Although research labs do acquire lost and surrendered pets because doing so is less expensive than purchasing from a kennel or cattery, most are perfectly happy to return a lost pet to it's owner if the pet is known to be in their facility and if research has not yet begun. Since lost pets may be included in their facility, it's important to get a handle on which Labs in your area use pets in research. These organizations are not required to comply with the Federal 5-day rule, since any animal surrendered to them is assumed to either already have been through a 5-day holding, or perhaps was sold to them by a licensed dealer of some sort. See additional details elsewhere in this website documentation. plan to investigate this site carefully. The tidbits you find will be invaluable for your efforts. Tip: The 5-day rule does not apply in all situations, in all pounds or shelters -- except, of course, pets must be held a minimum of 5 days. Sometimes you do have more than 5 days to recover an impounded pet. 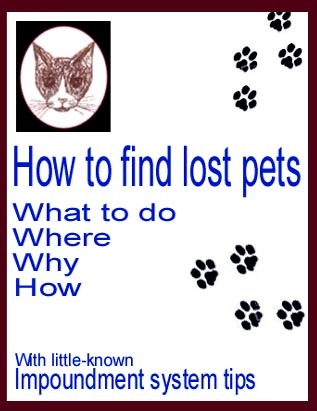 Keep your lost pet search going while studying this website's information.